Once home to its very own chocolate factory–the beloved Ghirardelli’s–San Francisco recently played host to a sweet event that made chocoholics across the Bay Area virtually melt with delight: the International Chocolate Salon at Fort Mason. 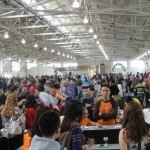 Now in its fifth year, the International Chocolate Salon (which is also held in other major metros where foodies flock), featured what the organizers deemed “the best of the best.” Three rows of vendor tables stretched the length of the airy pavilion, creamy bites of sheer luxury loading every surface. Tendrils of vanilla-scented temptation beckoned from every corner. Curlicues of ecstatic chocolate lovers wrapped around every plate of sumptuous samples. For six indulgent hours, the 50-plus up-and-coming master chocolatiers and confectioners in attendance had hundreds of guests eating right out of their hands. 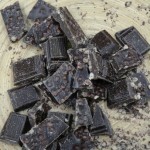 No wonder: chocolate has long been a major crowd-pleaser. Three thousand years ago, cacao, the seed from which chocolate is produced, was cultivated in Mexico and Central and South America, where it was sometimes even used as currency. Sipped in bitter drinks by seventeeth-century Spanish nobles and slurped down by Englishmen of all classes, chocolate swiftly conquered taste buds across Europe. Today of course the Swiss and the French enjoy a global reputation for producing—according to the most exacting standards—the world’s most irresistible chocolate candies. 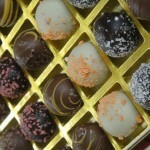 But we are not talking bad bonbons locally—not at all. Local chocolatiers at the salon displayed world-class creations in eye-catching colors and shapes that were every bit as delicious as they looked. Bars and truffles came infused with teas like Earl Grey and rooibos, studded with dried fruit (strawberries encased in white chocolate, yum! ), and spiced up with chiles. One bar even swapped in toasted quinoa for crisp rice, adding the seed (and its powerful nutrients) for crunch, but thankfully introducing none of the meh you might expect in a good-for-you candy. And at a time when big-name, corporate chocolate manufacturers try to bend the rules so that confections made with non-traditional, cheap ingredients can still be called “chocolate,” these smaller, often organic artisanal producers refuse to cut corners: only real cocoa butter, flavors, and sweeteners will do for them. Chemical additives? Out. How could sweets commonly shaped into “kisses” and hearts cause trouble any more serious than a Valentine’s Day sugar rush? 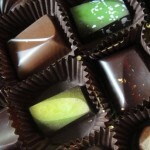 With chocolate, the problem isn’t in its consumption; it’s in its production. In West Africa, which supplies nearly 80 percent of the world’s cocoa, child labor and slavery is an ugly reality on many cocoa farms. On top of that, cocoa market pricing can be volatile, leading to economic insecurity for small cocoa farmers. In response, chocolatiers like Divine Chocolates and Alter Eco engage in fair trade practices to help farmers prosper and to keep children out of hot fields and in schools where they belong. The fair trade monitoring and certification system guarantees prices, prohibits child labor abuses, and promotes environmental protection. 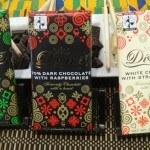 Many other smaller and premium chocolatiers are also fair-trade providers of candies with a conscious, and activists continue to demand that the biggest producers get in line. Some (okay, most) might say that the best thing to serve with chocolate is more chocolate, but a whirl around the salon turned up a still-more decadent pairing: wine and spirits. Port and petit syrah refreshed candy-coated palates for still more treats, while a chocolate martini took sin to a dizzying new level. After countless nibbles from a seemingly endless supply of goodies were consumed, the question, “Is there such a thing as chocolate overload?” needed to be asked. Judging by how quickly sample trays were repeatedly cleaned out and restocked, probably not. Late into the afternoon, festival-goers still showed no sign of slowing down. Lulu’s Chocolate—didn’t taste their chocolate, but their representatives were really cute! This entry was posted in Get Out - Food and Wine Experiences and tagged AlterEco, chocolate, divine chocolate, Her Coconess, Lulu's Chocolate, sf chocolate salon, soccola, Taste TV, The Tea Room. Bookmark the permalink.